In last season's Section 4A final, then-unheralded Mahtomedi pulled off one of the biggest upsets in recent playoff history by knocking out high-powered St. Thomas Academy (20-5-0). The Cadets (20-5-0) again are the top seed in the section, but if the teams should meet again in the finals as predcited (Mahtomedi is the No. 2 seed), a Zephyrs victory wouldn't be nearly as stunning. Mahtomedi is the only Class A team to beat St. Thomas Academy this season, in the regular season finale, no less, and boasts high-caliber talent at every position. 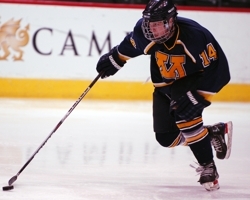 Mahtomedi junior Ben Marshall (pictured above), a Minnesota recruit who has racked up 48 points, ranks among the state's elite defensemen, and few scoring duos are more potent than the Zephyrs' Brandon Zurn and Charlie Adams, who have combined for 124 points. While yet another bout between Mahtomedi and St. Thomas Academy would undoubtedly make for high drama, No. 3 seed Totino-Grace, (14-10-1), No. 4 Spring Lake Park (18-7-0) and No. 5 South St. Paul (13-12-0) all have enough talent to spring an upset. Spring Lake Park is particulalry intriguing, given that the Panthers had Brainerd, a highly regarded Class AA team, reeling before eventually losing 4-3 in the regular season finale on Feb. 20. Of course, Totino-Grace shouldn't be overlooked, either. The Eagles' final four regular season games consisted of a tie with Class AA power Benilde-St. Margaret's, a win over Spring Lake Park, a narrow loss to No. 2-ranked (Class A) Breck and a win over Rochester Lourdes, the No. 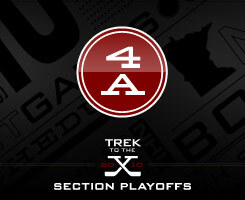 2 seed in section 1A. With WCHA recruits Christian Isackson (Minnesota, pictured at right) and Justin Crandall (UM-Duluth), St. Thomas Academy has two of the state's elite forwards. But the Cadets' forward talent doesn't stop with those two 50-point scorers. They feature a third 50-plus point scorer in Zach Schroeder, who has a team-best 29 goals, and right behind is 26-goal scorer A.J. Reid. Shootouts could be the norm in this section, as Spring Lake Park has some serious firepower in Nick Turbitt (56 points), Jorde Ranum (53 points) and 20-goal scorer A.J. Fossen. If winning is the only statistic that matters, it's hard to argue against Spring Lake Park's Mike Nelson (17-7-0) as the section's top goaltender. Only five goaltenders statewide had more victories. Yes, the Cadets have five losses, but two of them were to No. 1AA Minnetonka and two more came against Class AA powerhouses Blaine and Hill-Murray. 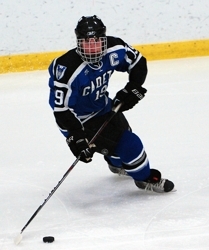 The ony setback that makes the Cadets appear vulnerable to an upset came in the regular seasaon finale on Feb. 18 against section rival Mahtomedi, a team they beat earlier in the season. If they meet again in the section final, as expected, the Cadets will most assuredly not be looking past the Zephyrs. Great goaltending can take a team great distances in the playoffs, although for South St. Paul a trip to the nearby Xcel Energy Center wouldn't require much travel at all. Junior goaltender Adam Wilcox, a Gophers recruit, has had flashes of brilliance but will need to be consistently spectacular if the Packers are to emerge from one of the state's deepest small-school sections.